1. Drill a 12mm (or 12.5mm) hole where the endpin used to be, to install the endpin jack. 2. Drill a hole through the bridge to allow the pickup wire to pass through. 3. Sand down the bottom of the old saddle, taking off the same amount as the height of the pickup that will now sit under it. 4. Solder the wire from the pickup to the endpin jack. OK, let the adventure begin! Firstly, before drilling a hole for the endpin jack, the old endpin needs to be removed. As this is tapered in shape, it should be easy to just yank it out. Get a good firm grip with your fingers and give it a tug. If you’re lucky, it’ll pull right out. In my case it did. Now you’re left with a hole that is too small for the endpin jack. As you are not drilling a new hole, but rather expanding one that already exists, the traditional method is to use a reamer. The problem with this method, however, is that a reamer leaves you with a tapered hole (unless you get a specialised one just for this job), so by the time you open the hole out to 12 mm at one end, it is still too small at the other end. To rectify this, you need to use a round file to file out the rest. I’ve done this before and it took a lot of time. So instead, I decided to try a different approach this time. It just so happens I have a stepping drill bit whose largest diameter is exactly 12 mm. As it is a stepping drill bit, it behaves in a similar way to a reamer, in that it enlarges holes as it goes through, rather than making one huge 12mm hole in one go. 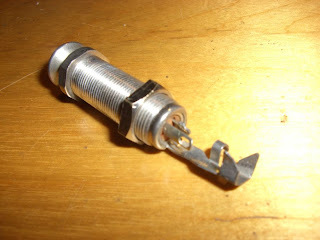 This makes it a nice safe way to drill the endpin jack hole without having to worry about splitting or chipping wood. I wasn’t quite sure how this method was going to work out for me, but it worked perfectly. Note that this will only work if the largest diameter of your stepping drill bit is 12mm. 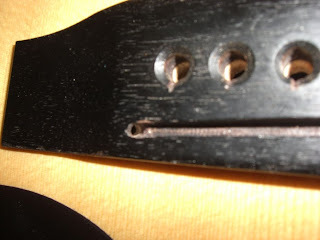 Most under-saddle pickups require you to drill a hole straight down through the bridge (under the saddle), but this particular pickup required the hole to be drilled at 45°. 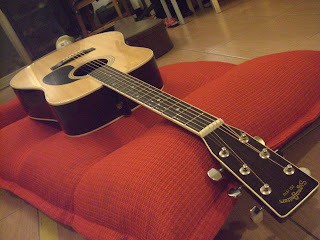 This was quite risky, as it was very difficult to avoid the bracing inside the guitar. 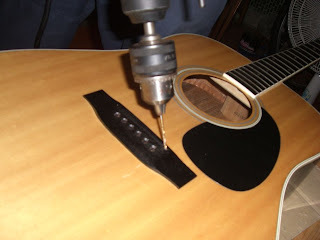 If you are ever doing this, have a good feel inside the guitar to try to locate the closest bracing, in the hope that you can somehow avoid it (whatever you do, don’t have your hand in there while you are drilling the hole). Luckily in this case it was possible to avoid the brace by about the width of a human hair (no kidding). The hole needs to be smoothed out with a small round needle file, so that there are no rough edges. 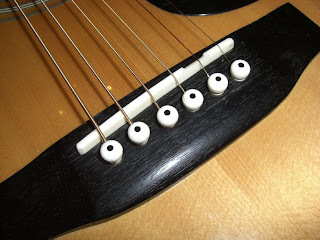 For this particular type of pickup, it is also necessary to round off the 45° angle, so that the pickup/lead doesn't get a kink in it. 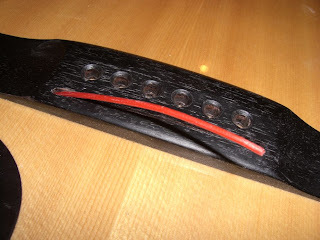 The pickup lead now needs to be fed through the hole and the pickup then placed in the saddle slot. Now you need to sand the same amount off the bottom of the saddle as the height of the pickup. Use a Vernier caliper to measure the thickness of the pickup, then mark this on the bottom of the saddle. Simply rub the saddle against sandpaper taped to a very flat surface (it’s extremely important to get a flat surface on the bottom of the saddle, so do it right) until you have sanded off the correct amount. 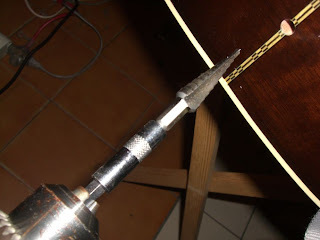 The last thing you need to do before stringing up the guitar is to solder the pickup lead to the endpin jack. Make sure that before you do this, you slide any endpin jack covers, nuts, washers, etc., up the lead, as you won’t be able to do this once it’s soldered. 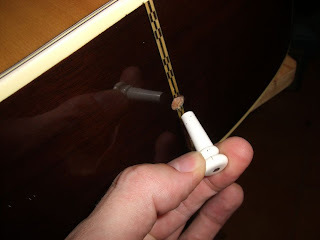 You can slide these parts up the cable from inside the guitar, then pass the lead through the endpin jack hole to do the soldering outside the guitar. It’s a good idea to protect the finish on your guitar with rags or something while doing the soldering. Once soldered, push the endpin jack into the hole. 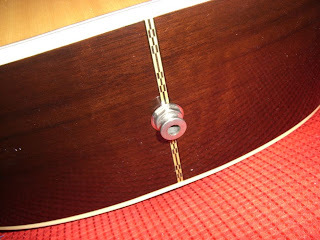 Feed the washer and nut down the lead and onto the endpin jack (inside the guitar – yes, it’s fiddly). Tighten the endpin jack nut, making sure that it is nice and tight, as it will have a tendency to work loose otherwise. If there is some sort of endpin jack cover, fit this now. 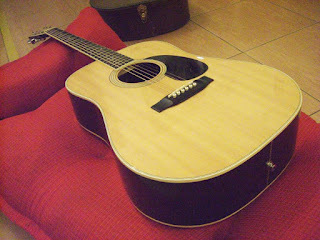 Now place the saddle in the saddle slot and string up the guitar. Here's the finished product. She's a beauty, isn't she? Sounds great too.